Percy Bysshe Shelley was one of the major English Romantic poets and is widely considered to be among the finest lyric poets of the English language. He is perhaps most famous for such anthology pieces as Ozymandias, Ode to the West Wind, To a Skylark, and The Masque of Anarchy. However, his major works were long visionary poems including Alastor, Adonais, The Revolt of Islam, Prometheus Unbound and the unfinished The Triumph of Life. Shelley's unconventional life and uncompromising idealism, combined with his strong skeptical voice, made him a authoritative and much denigrated figure during his life. 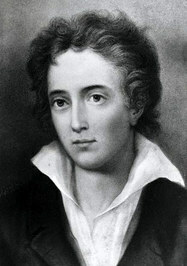 He became the idol of the next two or three generations of poets, including the major Victorian and Pre-Raphaelite poets Robert Browning, Alfr Percy Bysshe Shelley was one of the major English Romantic poets and is widely considered to be among the finest lyric poets of the English language. He is perhaps most famous for such anthology pieces as Ozymandias, Ode to the West Wind, To a Skylark, and The Masque of Anarchy. However, his major works were long visionary poems including Alastor, Adonais, The Revolt of Islam, Prometheus Unbound and the unfinished The Triumph of Life.